A diverse selection of original recordings made by Jan Spálený’s Apollobeat between 1967 and 1971 is now being released by Tomáš Padevět in cooperation with Supraphon. 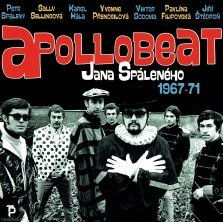 One of the major Czech bands of the second half of the 1960s, Apollobeat’s music was above all distinctive in its ample employment of wind instruments. Originally named The Hipp’s, the band changed its name in the spring of 1967, when it was engaged at the Apollo theatre by its artistic director, Jiří Štaidl. The lyrics, mainly provided by the poets Pavel Vrba, Rostislav Černý and Jiří Štaidl, introduced plenty of foreign songs to the Czech audience. Apollobeat accompanied Apollo’s stellar singers – Yvonna Přenosilová, Karel Hála, Petr Spálený, Sally Sellingová and Pavlína Filipovská – and subsequently, following the theatre’s dissolution, Viktor Sodoma, with whom the band performed in December 1968 at the legendary second Czechoslovak Beat Festival at the Lucerna hall in Prague. From 1969 on, the only vocalist was Petr Spálený, for whom Vladimír Poštulka wrote the bulk of the lyrics. The vintage Apollobeat music was composed by Jan Spálený and Pavel Krejča. The present compilation features 48 original tracks, with 20 of them being released on CD for the very first time (with Duch na hradě and Kuchařská píseň being released for the first time ever). This year, a full half-century has passed since Apollobeat was formed. The listener is finally afforded the opportunity to enjoy 155 minutes of fabulous music, which in its time was known as “beat”.